Israel based Meprolight is a leading manufacturer of various optical sights for military, law enforcement as well as civil applications. 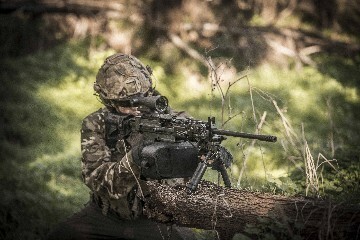 They are a member of the SK Group and their product offerings include thermal and night vision equipment, electro-optical systems, self-illuminated sights and laser rangefinder systems. Their latest additions to their scope family are the MEPRO 4x and 6x Day Scopes. They’re an extension of their offerings of telescopic sights for sniper rifles and LMGs. The MEPRO 4x offers a 4x optical magnification for medium distance engagements. 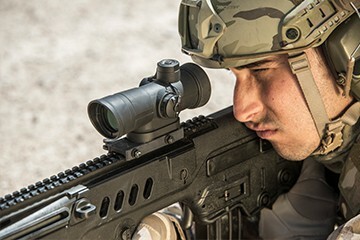 The scope is used by the Israeli Defense Forces (IDF). It comes with a weight of around 1.7 lbs. The 6x optical magnification makes the Meprolight MEPRO a good choice for longer-range engagements of up to around 1,000 yards. It was developed with such engagements in mind and combines a wide field-of-view with high accuracy. It holds its aim and maintains its recalibration even under the most difficult conditions. This makes it a great fit for light machine guns in military-style applications. The 6x scope is lightweight at around 640 grams. Both scopes utilize a quick-release Picatinny style adaptor. Being an illuminated sight, they each offer five different brightness settings for every surrounding condition. This ensures the most accurate target acquisition in the most efficient way. The MEPRO 6x as well as the 4x are built very robust and can withstand high levels of recoil. This specifically makes the 6x a good choice for LMGs as well as sniper rifles. The illumination requires a single battery. To prolong battery life, the scopes do come with sophisticated energy-saving applications to allow for extended periods of operation. The reticle on the 6x comes with ballistic correction for a variety of calibers. These include the SS109 Crosshair, Chevron or Horseshoe, Dual Caliber as well as 300 Blackout and LMG (Light Machine Gun) options. The 4x is available with reticle choices for 5.56mm and 7.62mm calibers.